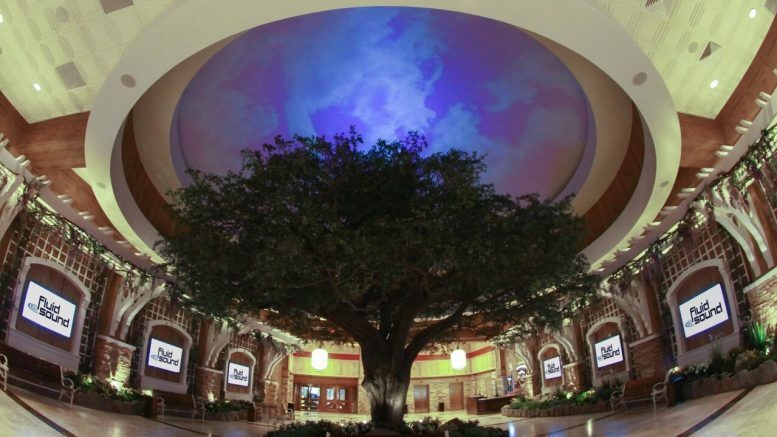 Barona Casino & Resort, which features a 400-room hotel, a luxury spa, restaurants, a golf course, and gaming floor, was undertaking a huge expansion that would grow the square footage of its casino floor by 30,000 square feet. The expansion includes 535 new machines, two table game pits, swanky new bathrooms, a new VIP area, and a larger food court with some exciting new offerings. Challenge: Providing an exciting and vibrant environment for casino guests was paramount in this project, as was creating a seamless experience as guests travelled from the legacy casino floor to the newly expanded area. Barona needed a way for their casino operator to easily control the casino’s atmosphere through an intuitive system that can manipulate audio, video, and signage. Solution: More than 60 NEC professional monitors and displays for both broadcast video and digital signage, a Crestron signal system with iPad control integration, Cisco network switches, Peavey digital audio signal processors with CobraNet for connection to the existing legacy audio system, Just-Add-Power HDMI over IP devices, a custom video dome that displays a 20K lumen image using NEC projectors and Navitar custom 180 degree fisheye lenses over the 40-foot dome surface using 7th Sense Video Media Server for projection mapping and Scalable Display software for projector stacking.